In early January 2017, Changi Airport launched the ‘Changi Airport Living Lab Programme’, in partnership with the Singapore Economic Development Board (EDB) to drive innovation over the coming 5 years. OpenGov finds out more about the Living Lab Programme from Mr. Bernard Siew (above image, extreme right), Vice President, Process and System Innovation, Changi Airport Group. Could you tell us about the origins of the Changi Airport Living Lab Programme? Innovation has always been a core part of Changi Airport’s DNA. Even though we have pioneered many new and first-in-the-world facilities and services to enhance the airport experience, we recognise the importance of increasing our pace of innovation to strengthen the airport’s competitiveness. The Changi Airport Living Lab programme was established as an enabler to accelerate innovation through partnering leading companies and startups, to develop and demonstrate new innovations, using the airport as a live test-bed. In terms of partnerships and collaboration, which are some of the government agencies will you be working with as part of the Living Lab Programme? Can you tell us about any specific projects that are currently in progress? 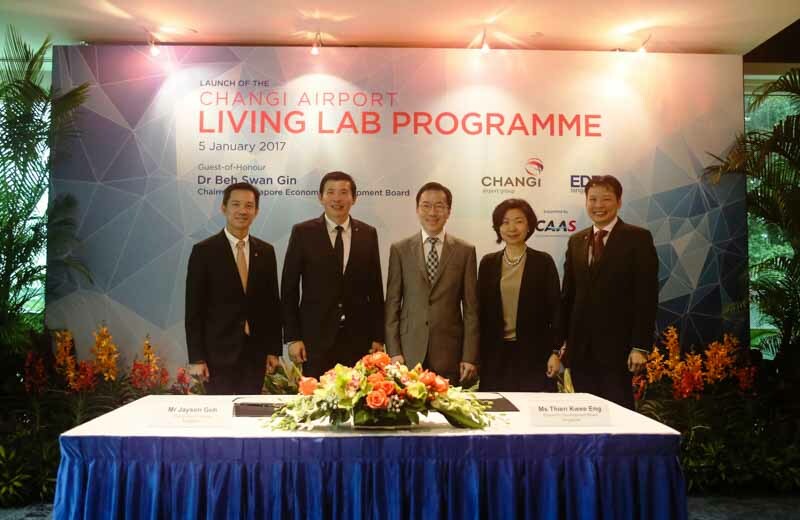 The Changi Airport Living Lab programme was established in partnership with the Singapore Economic Development Board, with the support of our regulator, the Civil Aviation Authority of Singapore. We also regularly engage other government agencies to identify potential partners for the programme. Some of the projects in progress include exploring the use of automated guided vehicles to ferry passengers between terminals, taxi queue analytics to provide real time information to enhance the ground transport experience at the airport, and autonomous cleaning robots for cleaning of terminal floors. What are the plans or short-term goals of the Living Lab Programme for the next 1-2 years? We would like to expand our network of innovation partners including companies, startups, SMEs, research institutes, and see more of them coming on board to embark on projects to test-bed and co-develop new solutions with us. What are some the tangible objectives and outcomes that we can expect to see out of the Living Lab Programme after 5 years? A successful outcome would be seeing some of the testbed projects turn into scalable solutions which can be deployed in our terminals, and for our partners, to see the creation of new products and solutions out of Singapore which can be scaled to similar environments (e.g. retail malls) and exported to the world. Partnerships between academia, government and the private sector seem to be driving an increasing number of projects. Can you share your views on such partnerships and pushing research and applications of technology? As a corporate entity, Changi Airport Group (CAG) sees value in collaborating with other players in the eco-system to accelerate the bringing of technology to market. Such players include innovation-driven companies, startups, SMEs, research institutes with their technologies, and government agencies with their networks. With more than 58 million high-value passenger movements in a year, generating over S$2.3billion in concession sales in one location, we offer a rich test-bed and valuable data to our co-innovation partners to develop and refine their solutions.